HP Calculators Timeline » HP 35 » HP 35 was invented 35 years ago. 2007 marks the 35 years of HP Calculators history. 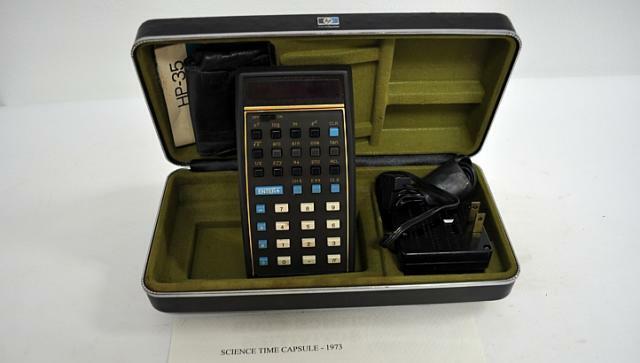 Introduced on 1 February 1972, the Hewlett-Packard HP 35 was the first handheld electronic calculator sold by Hewlett-Packard Company. HP35 was the first handheld ever to perform logarithmic and trigonometric functions with one keystroke. In effect it was the world’s first electronic slide rule. As opposed to later HP calculators, it has an x^y function, not y^x, and the trigonometric functions work in degrees only. It does not have a shift key like later models, but there is an ARC key for use with SIN, COS, and TAN to give their inverses. Hewlett-Packard sold over 100000 of the original HP 35 the first year. The Hewlett-Packard 35 was aslo known as the "electronic slide rule" during that era. The above HP 35 was unearthed in 2012 from a 1973 Time Capsule buried by the Singapore Science Centre. In July 2007, HP introduces its "retro looking" HP 35s with better key placement and color contrast as compared with the HP 33s. Tagged By: HP 35 Calculator Unearthed, HP Calculator Heritage Ads 1972.